The PICU Doctor app is an app version of the PICU Cardiac Guide, available online or in PDF form. 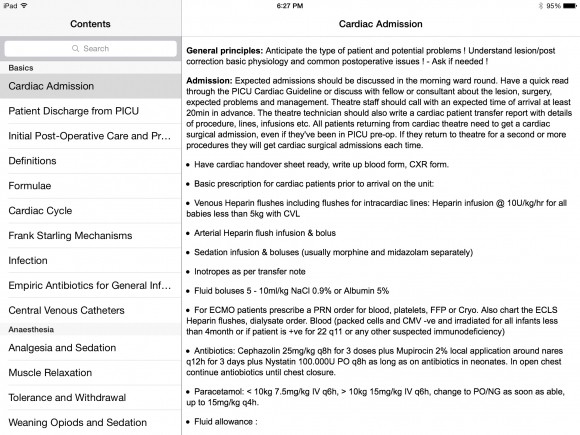 The app, which is geared toward Pediatric ICU providers with a specific focus on Cardiac ICUs, contains a tremendous amount of information In this case, that is both a blessing and a curse. The content and layout is like that of a very thorough notebook containing clinical information, physiology, drugs, and more; however, its layout is more suited for reference and studying than use at the point of care. Furthermore, many of the clinical recommendations and guidelines are from Australia and the UK, limiting its utility in the US. A major redeeming factor of this app are its images of congenital cardiac abnormalities, although it is difficult to transfer or open the images in other apps that would be conducive to personalizing and sharing. 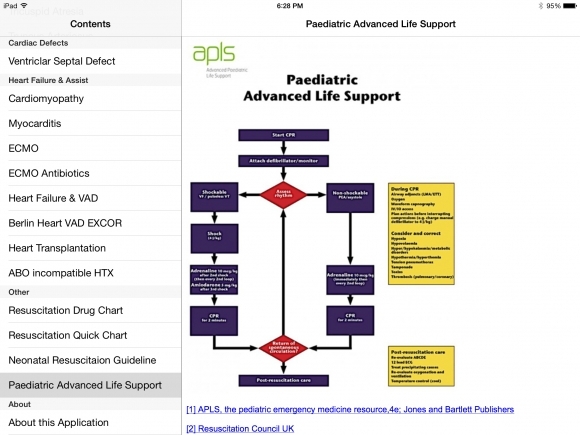 The app was created by an Australian Pediatric Intensivist, Dr. Marc Anders, and is designed to be a comprehensive guide to pediatric intensive care, with a specific focus to management of congenital cardiac disease. 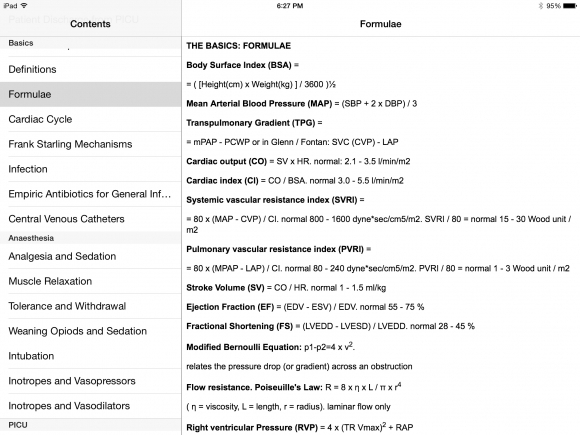 The guide and app also have background physiology and pharmacology information that is a nice clinical refresher. The app is laid out like a detailed PICU notebook, formatted with the table of contents on the left and content on the right. The subjects are broken down into “Basics,” “Anesthesia,” “PICU,” “Cardiac Defects,” “Heart Failure & Assist” and “Other” sections. Within those sections are a number of topics. “Basics,” for example, includes subjects ranging from admitting a cardiac patient to a review of the Frank Starling mechanism. The subjects are generally text heavy but many are written in outline form and there are occasional tables breaking up the text. There are a number of formulas but no calculator functionality, which is frustrating. Similarly, there is no medication calculator, which would have been helpful in the many drug tables throughout the app. Most sections include references with hyperlinks to their PubMed citation, although it is often unclear to which aspects of the text the references refer. The background information in each section is helpful, and while most aspects of management are universal, some are specific to Australia and the UK; for example, recommending flucloxacillin as an empiric antibiotic for children over 3 months, which is not available in the US. 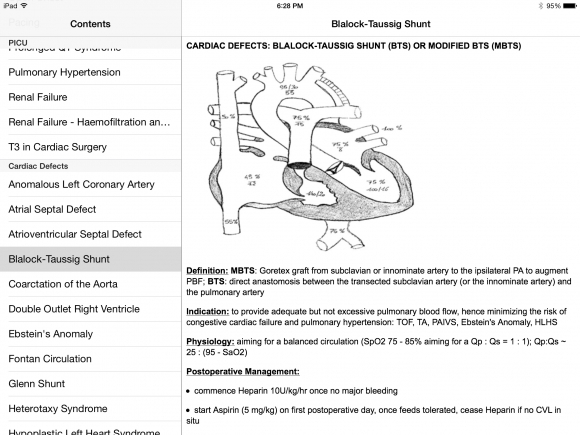 The app also includes a large section on cardiology, covering the most common congenital cardiac lesions. Many sections include helpful schematics with pressures and oxygen saturation percentages in the heart chambers and great vessels along with descriptions of the pathophysiology and tips for management. However, the pictures are not easily exportable to other apps, such as the DrawMD apps, which would permit personalizing or annotating. 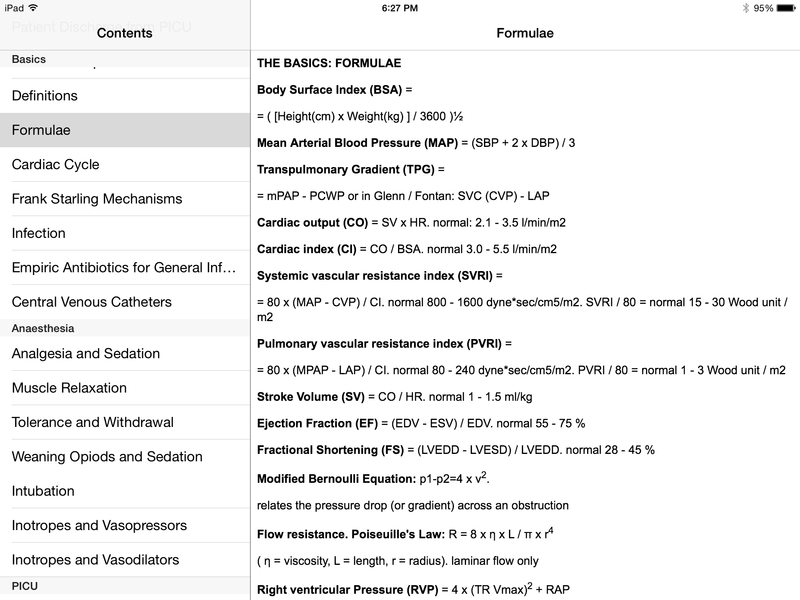 The app also contains more detailed information on heart failure management, ECMO and the Berlin Heart, incidentally with an ABO incompatibility chart oddly placed in that section. The last section of the app includes resuscitation charts, and while the medication dosages are fairly standardized (although taking the seconds to realize “adrenaline” is “epinephrine” in a code situation is not recommended), the neonatal and pediatric life support guidelines differ from the NRP and PALS guidelines used in the US. There is a search function in the app but it only permits searching by subject headings, not text within subjects. This deficit is a major limitation for an app with this much text. 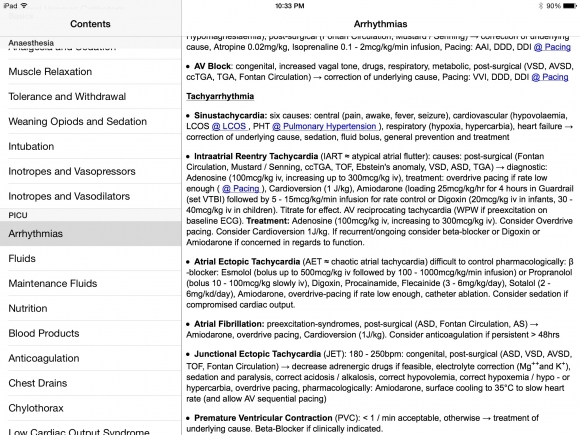 For most sections of the app, there are references but they are general and not linked to specific text. Other sections do not have references at all. In the text, there is usually no differentiation of where management is based on broader guidelines or whether they reflect local practice patterns. Geared toward providers, but congenital cardiac lesion pictures may be somewhat useful in talking to parents of children with congenital cardiac lesions. 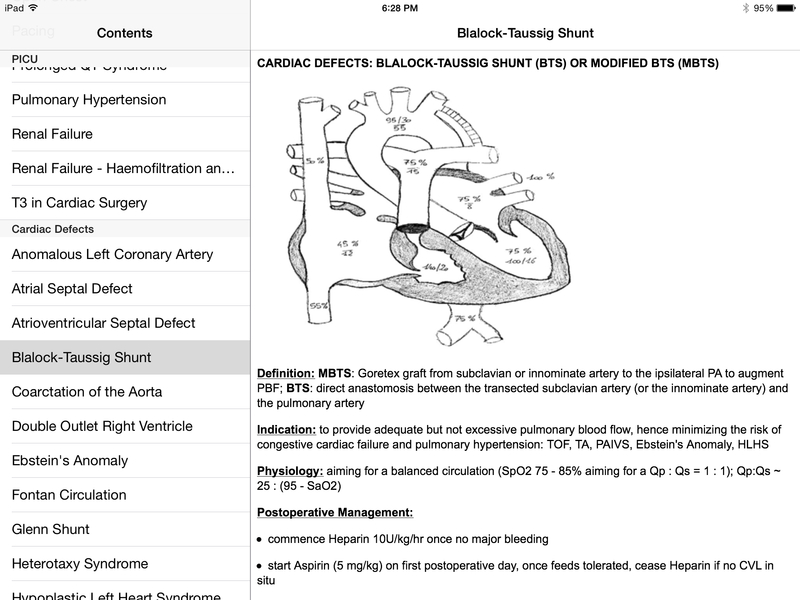 The PICU Doctor app has many benefits for trainees on pediatric cardiology or PICU rotations, making it a good background resource for skimming before those rotations. 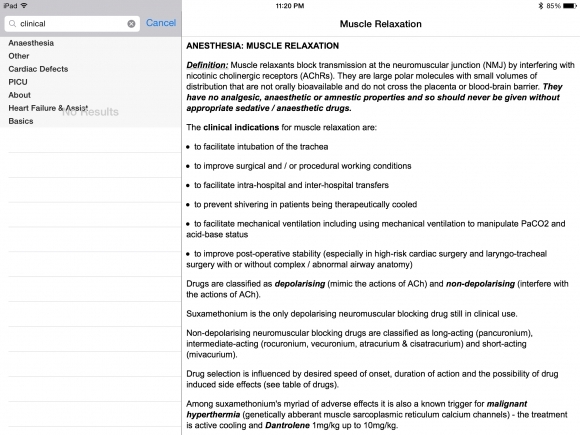 However, the differences in management in the US, the difficulty in searching for specific text, and the formatting of the app, make it hard to use at the point of care. Overall, while the price of the app is right, it should be used with caution in US care settings.